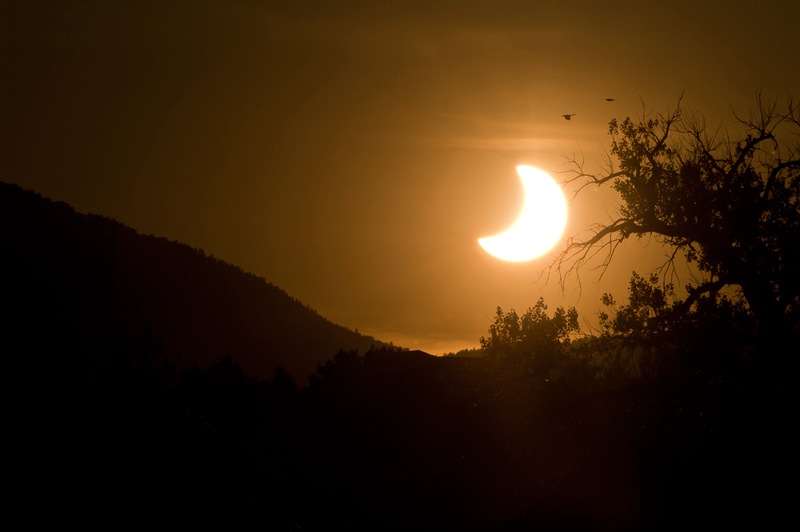 This is one of the photos I took during the Annular Eclipse Sunday. I thought I'd post it here for some critiques about any changes needed, composure, light or dark, etc.. Sadly, the edit brought out the compression effects, so try doing it with the raw file you have. I think the exposure's right on, but there's a lens flare blob below the sun, in the shadows of the trees. Rather small. Also, with the K20D, you should be careful about pushing the deepest shadows -- the noise pattern of the sensor is not the nicest and if you print it on something that can resolve that kind of detail, it may bother you. Other than that, I think it's great! I agree with tackyat.2. The image is nice as it is. I'd probably play with cropping a bit to tighten up the image just a little (a little from the left, bottom, top) to see if there is any improvement to be had there, but I kind of like the composition as it is. I just tend to obsess with minute cropping details when I work with my own photos. I agree that the small lens flare spot that shows up in the tree/shrub under the sun is a bit distracting, and there is a small flare spot directly to the right of the sun underneath the upper branch of the large tree that is a bit distracting. Congratulations ! You did not miss this unique opportunity. Have you tried a portrait format, keeping the right part of the image?